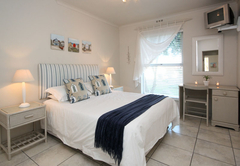 The Potting Shed Self Catering is a 3 star graded property offering Hermanus accommodation for tourists and visitors of Cape Overberg. 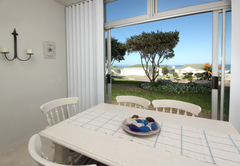 Hear and see the ocean from either of our self catering units in a peaceful, sea facing, upmarket complex with 24 hour security. 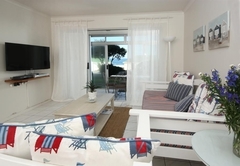 This beautiful seaside town in the Western Cape is only an hour and a half away from Cape Town city center and 1 hour form the international airport. 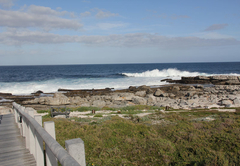 Whale Rock Estate at Tobago Bay, Hermanus, has a stunning view of Walker Bay, where the Southern Right whales are often seen breaching and blowing along the rocky coast line only seconds from your door. 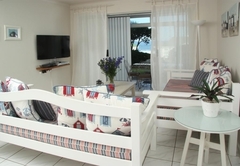 Take a stroll along the walk way to the sea, approximately 90 meters from your patio. 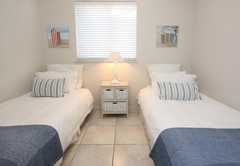 Our family friendly apartments are identical in size but vary slightly in décor. 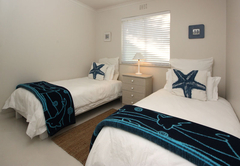 Both have a double and twin bedded room, with sleeper couches in the lounge to accommodate up to six guests in each unit. Bed linen is provided. 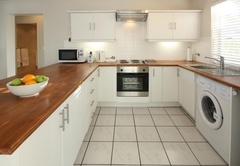 Kitchens are fully equipped with a washing machine, microwave and fridge/ freezer, along with everyday utensils such as cutlery, crockery, braai (barbecue) tongs, iron and ironing board etc. 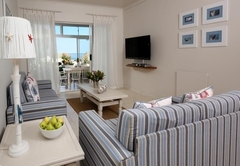 TV, DSTV (compact package), and a DVD player are provided in the lounge. 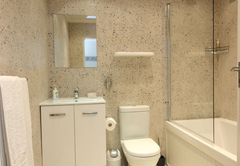 Panel heaters provide extra comfort for cold winter nights. 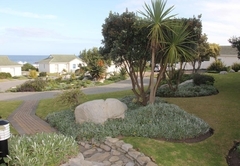 Play a game of squash in the court provided, or swim in the pool at the recreational area, where you have use of an outdoor brick built braai / bbq. 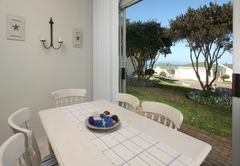 Alternatively, braai / bbq with the Weber provided in your stoep, in the privacy of your own apartment, whilst enjoying the sound of the crashing waves. 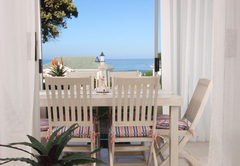 Situated just 1 km from the new harbour, it’s an ideal location to sample local fresh caught fish (and sushi) at one of the fabulous sea food restaurants. 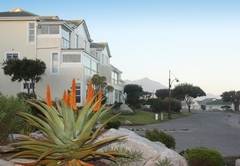 The apartments are 3 kms to the town centre and 5 kms to Hermanus Golf Course (27 holes). 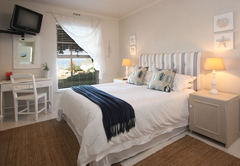 Accommodation with stunning views of Walker Bay, 3kms from our Guest House & town center. 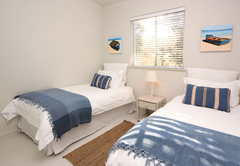 Self-catering apartments in a secure complex. 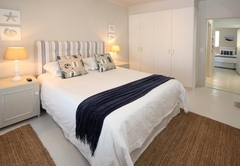 Each apartment has 2 bedrooms, stoep with Weber braai. 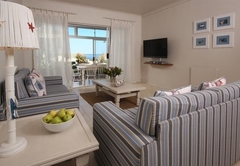 Lounge with flat screen DSTV (compact package) & WI-FI. 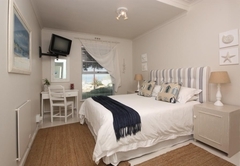 Accommodation with stunning views of Walker Bay, 3kms from our Guest House & town center. 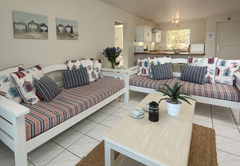 Self-catering apartments in a secure complex. 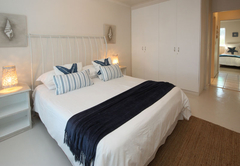 Each apartment has 2 bedrooms, stoep with Weber braai, Lounge with flat screen DSTV (compact package) & WI-FI. 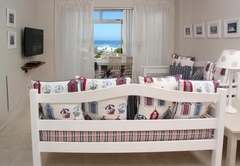 Our stay at The Potting Shed Self Catering was a wonderful family weekend! Next time we will stay longer! Our twin 3.5 yr old boys didn't want to leave! 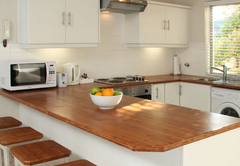 It was probably the cleanest self catering I've ever been in and we had everything we needed! 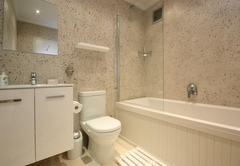 Very safe in a security complex and super close to the town centre! Annamarie and her staff were super friendly and efficient! Check in and out was a breeze!! We will definitely be back! 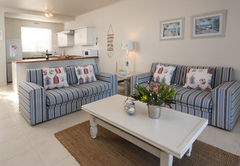 Response timeThe Potting Shed Self Catering typically responds to requests in 5-10 minutes.